Stucco is a concrete-based outside layer. Stucco bonds tightly with the substrate to create a shell that helps to weather seal the structure. 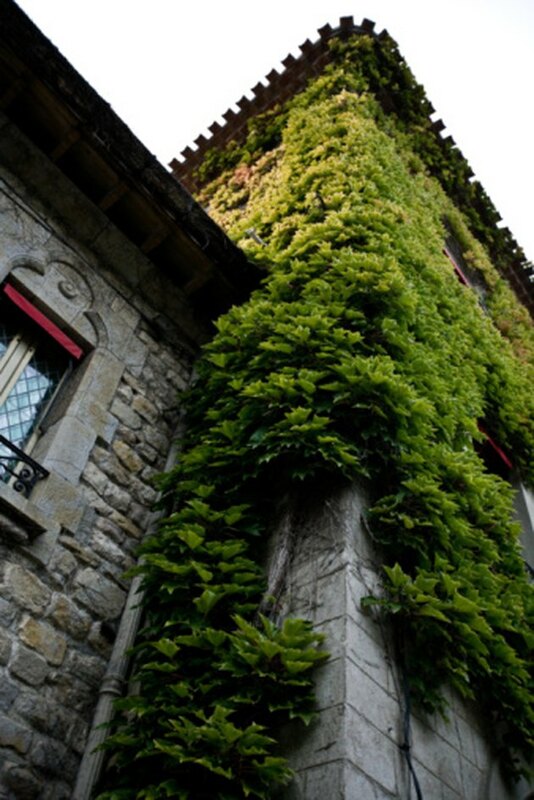 Stucco typically has a surface texture that allows climbing vines such as Ivy to grip and scale the surface. Removing Ivy vines from the structure may reveal stains. Ivy blocks sunlight and wind, which can cause the stucco surface to remain dark and damp thereby providing a an environment for mold and mildew growth. Ivy also leaves behind green or brown stains from the vine itself. Remove Ivy stains and residue to restore the stucco facade. Spray the stucco wall generously from the top to the bottom with plain water from a garden hose. Water helps to prevent the stucco from absorbing stains. Mix 1/2 cup laundry detergent and 1/2 cup of borax with 1 gallon of water. Add 1/2 cup of bleach if you have mold or mildew stains on the stucco. Gain access to the top of the stucco structure using a ladder if necessary. Dip a stiff scrub brush into the cleaning solution and scrub the stucco surface. You can also use a stiff broom attached to a long handle to access high areas. Remove Ivy shoots and discard them as you find them on the surface of the stucco. Shoots or suckers are small pieces of the Ivy that take hold on the rough stucco texture. Do not throw Ivy suckers or shoots to the ground because they can root, grow and climb your stucco structure again. Place Ivy shoots or suckers into a plastic bag and tightly seal the top. Scrub a small 6- by 6-foot stucco section at a time and rinse with water from the hose to keep the soap from drying on the stucco surface. Continue to scrub the stucco in manageable increments until you remove all Ivy residue. If Ivy stains remain, continue to the next step. Mix dry trisodium phosphate (TSP) and water in a bucket according to the manufacturer's directions. Dip a scrub brush into the mixture and scrub away stains. Rinse well after application to remove TSP residue from the stucco. TSP requires special handling and safety precautions when using. Wear safety goggles, rubber gloves, a protective jump suit and a respirator.